PT-141 is the first of a new class of drugs called melanocortin agonists being developed to treat sexual dysfunction. 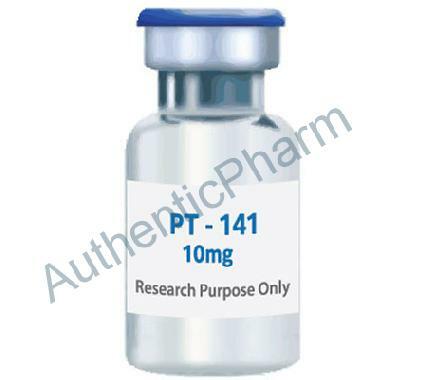 The mechanism of action of PT-141 may offer significant safety and efficacy benefits over currently available products because it acts on the pathway that controls sexual function without acting directly on the vascular system. Clinical data indicates that PT-141 may be effective in treating a broad range of patients suffering from erectile dysfunction. The nasal formulation of PT-141 being developed is as convenient as oral treatments, is more patient-friendly than invasive treatments for erectile dysfunction, such as injections and trans-urethral pellets, and appears to result in a rapid onset of action. The drug could even prove to be more popular than Viagra which works by directly stimulating blood flow in sexual organs. But for many women, it is lack of libido - not physiological difficulties - that causes them problems. By contrast, PT-141 targets the brain's arousal centre and looks more likely to defrost sexual interest. The feature of the drug that makes it most attractive is it's apparent ability to arouse women sexually. Some have called it Viagra for women. In studies done with mice, female mice given PT-141 began to mount male mice in an act of heightened desire to mate.